My contribution looked at how to strengthen the province’s legislature, which is increasingly dominated by the government – especially given the reduction in legislative seats at the last election. I argue that adopting longer sitting hours and increased autonomy for committees would help to restore the balance. In particular, I recommend that the legislature take over the process of pre-budget consultations which are currently conducted by the executive. A collection of excerpts can be found on The Telegram’s website. The Democracy Cookbook was driven by editors Alex Marland and Lisa Moore of Memorial University Newfoundland. They brought together the many contributors, donors, and partners involved, hounded us to stay on track, and challenged us to provide straightforward ideas in straightforward language. I’m grateful to be part of the project, and hope that it both leads to meaningful change, and inspires those passionate about governance in other provinces to follow suit. Yesterday I was interviewed by the CBC for my thoughts on the latest instance of abortion politics at the Ontario Legislature. On October 4, the Liberal government introduced Bill 163, the Protecting a Woman’s Right to Abortion Services Act, which would ban protests within a radius of 50 m around facilities that provide abortion services and the homes of their staff. The protest “bubble zone” could be expanded up to 150 m in some cases. The bill was brought forward after several media reports emerged last spring that protesters at abortion clinics were becoming increasingly aggressive. The day after Bill 163 was introduced, the Progressive Conservative (PC) party moved a motion to immediately pass it through all legislative stages. However, the motion required the unanimous consent of all MPPs, which the government denied. The government’s rationale was that MPPs should hear from stakeholders before agreeing to the law. The opposition argued that the government was only raising the abortion issue at divisive political tactic. CBC reporter Mike Crawley asked me what I thought was really going on. Why would the government seek to slow the passage of its own bill? The government has a point that stakeholders may want the chance to share their views on the bill. For instance, some would like the larger 150 m bubble zone to be adopted by default, not only with special permission. However, the government already spent much of the summer consulting with stakeholders. As such it is doubtful that legislative hearings would turn up much in the way of new views. Indeed, the only new opinions would likely be from those like to stop the bill from passing at all. and the emerging axis of contention between those who support the recognition and accommodation for religious minorities and those who wish to limit their rights, for instance on matters of religious dress. The reality, however, is that both May and Corbyn deserve credit, with each improving their party’s vote share from the 2015 election: while Labour had the biggest gain from 30% to 40%, the Conservatives still rose from 37% to 42%. That both major parties could improve their vote share by a combined 15 points speaks to a broader trend from the 2017 election – the collapse of support for the smaller parties to the lowest level in more than 40 years. This decline was most notable for UK Independence Party, whose share of the vote fell from 13% in 2015 to just 2%, but could also be seen for the Greens, Liberal Democrats, Scottish National Party, and Plaid Cyrmu as well. Only in Northern Ireland, where the major parties do not compete, did the vote share for the small parties hold by default. Save the date! 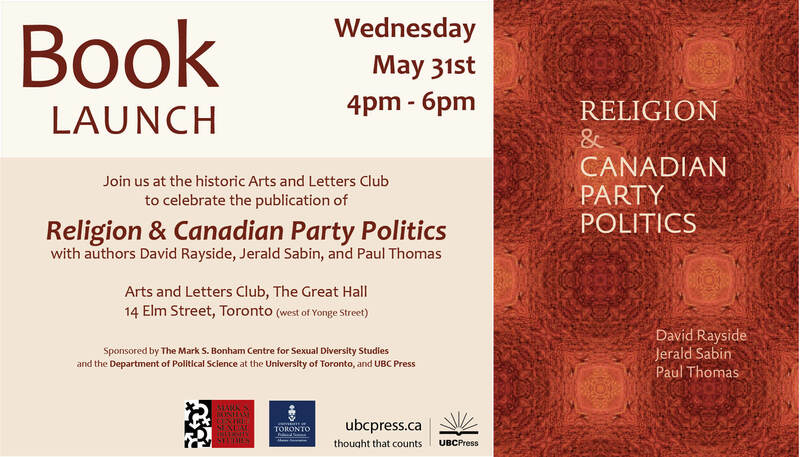 David Rayside, Jerald Sabin and I would like to invite you to the launch party for our new book Religion and Canadian Party Politics, which is taking place May 31st, 2017 at the historic Arts and Letters Club in Toronto from 4 to 6 PM. The event is conveniently located just across Yonge St. from Ryerson University for those attending the Congress of the Social Sciences. 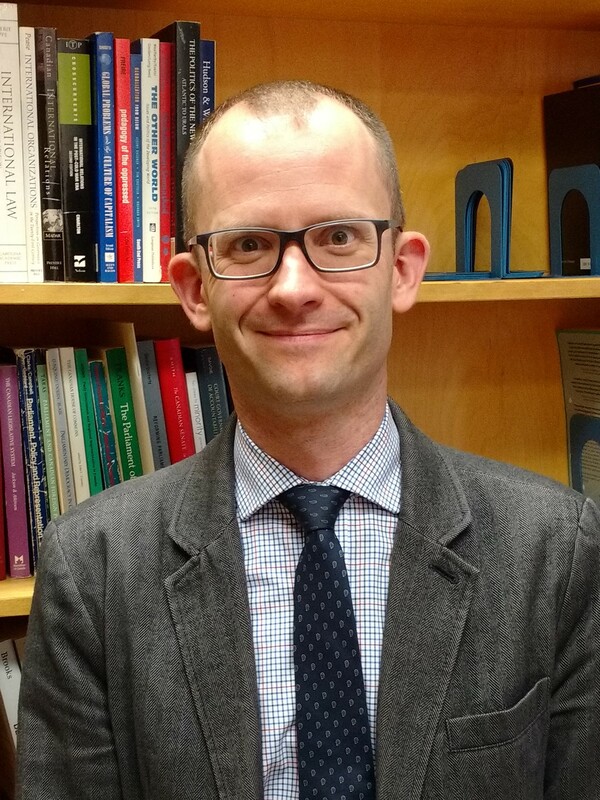 We’re grateful to the Mark S. Bonham Centre for Sexual Diversity Studies, the University of Toronto Department of Political Science, and UBC Press for sponsoring the event, and are looking forward to seeing you there. This week one of my students emailed asking if I could help him with a journalism assignment. He was writing a piece on prospects for electoral reform in Canada now that the Liberal government has abandoned its plans to change the voting system, and was wondering if I could give some commentary. Below is what I sent him. I’m curious to see how it compares with other people’s assessments of the way forward. I don’t believe that electoral reform is likely to succeed in Canada unless there is a drastic change in the way that it is approached. The one common factor in the reform processes at the Federal level and in BC, Ontario, and Prince Edward Island is that the parties involved campaigned on a promise to pursue electoral reform without specifying exactly what new system would be put in place. Instead, after forming government the parties each began consultation or committee processes to determine proposals for what system should be adopted. In the provincial cases these proposals were put to referendums, all of which failed. In each case (and especially in Ontario), it was argued that the government did not do a good job of promoting the referendums, with many voters not actually being aware of the issues when they went to vote. At the federal level, the government appears to have decided that it did not like the proportional approach recommended by the Special Committee on Electoral Reform, and so decided to kill the process rather than designing a specific system to put forward in a referendum.